Throughout the week, children will participate in various activities which will end with a medal ceremony. The medals handed out will be ones made by the children. A week unlike any other, an Olympic week! Here are a few suggestions for circle time: Olympic opening ceremony, Olympic hymn, Olympic flag, Olympic torch relay, Olympic oath. 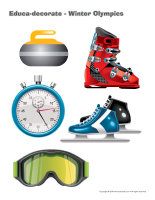 (Open stickers-Winter Olympics) Print the illustrations on adhesive paper and use them to create original stickers for your group. 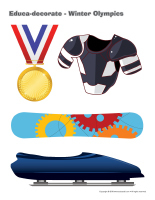 (Open educa-theme-Winter Olympics) Print and laminate the different elements representing the theme. Use them to present the theme to your group (and their parents) while decorating your daycare. 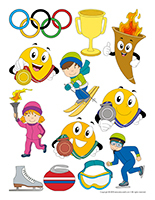 (Open educa-decorate-Winter Olympics) Print, laminate, and cut out the illustrations. Use them to decorate your walls and set the mood for the theme. Decorate the daycare with black and white drawings of the Olympic rings. Have children color them. (Open Olympic rings). You may also use the flags of various countries from the educatall Club. Place a podium in a corner. It can simply be three small benches or stools. 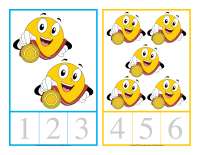 Predetermine the positions (example: Bronze: the best participation, Silver: the best effort, Gold: the best result). After each event, position the children on the podium. Present bouquets and paper medals which children may accumulate throughout the week. Make sure each child receives at least one medal per day. Variation: the older children can be judges. They hold cards with numbers 1 to 10. After each event, they attribute points to each child. You tally the results. We have prepared everything you need for this activity. (Open Olympic scoring game) and (Open Olympic scoring record). Print as many copies as you need. Many events require a start and finish line. You may want to install these for the week using coloured electrical tape.You may also create an area which can be used to interview the athletes. The picture game may be used as a memory game or to spark a conversation with the group. The pictures may also be used simply to decorate the daycare or a specific thematic corner. (Open picture game-Winter Olympics) Print and laminate. Store the game in a "Ziploc bag" or in your thematic bin. (Open Winter Olympics-schedule) Print and display. Olympic torch relay (see Olympic torch in the Arts & Crafts section) Children follow a path carrying their Olympic torch. Play music. Throughout the week, children participate in various events and collect medals and points. 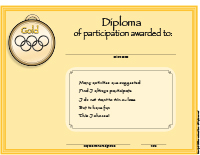 (Open diploma and Olympic medal) Print and laminate the Olympic medals. Use a sharp knife to cut a slit (at the top or on the sides) and thread a ribbon through it. Award each child with a diploma and medal. Mark the occasion. Serve hot chocolate to the group and their parents. (Open perpetual calendar-Winter Olympics) Print and display. (Open schedule-Winter Olympics) Print. Complete the schedule by listing all planned activities and display it where parents can see it. The flashcards may be used during circle time to spark a conversation or in your reading and writing area. They may also be used to identify your thematic bins. 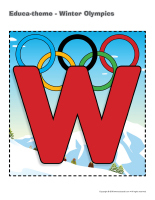 (Open word flashcards-Winter Olympics) Sports, medal, bronze, silver, gold, podium, torch, Olympic rings, team, score, ceremony, winner. Place hoops on the floor (one per child) or draw circles. The circles must be large enough to allow children to move inside them. Give children instructions. For example, place your hands on the floor, place one foot inside your goal and one outside your goal, sit inside your goal, sit outside your goal, etc. After a while, say, "Goalies change goals." Children change circles and the game continues. Prepare an obstacle course. Give each child two empty Kleenex boxes. Have them place the boxes on their feet to skate around the obstacles. Variation: Organize a team obstacle course. Divide the group into two teams. Set up two identical obstacle courses side by side. When the first child of each team has completed the obstacle course he must return to touch the following team member's hand. 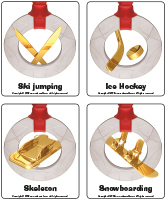 (Open figure skating elements) Pick a card which represents a figure skating element. Play music and have children (one at a time) present a solo. Their solo must contain the element shown on the card. Variation: When the music stops, everyone falls down. When the music starts up again, children resume skating. Continue the game until the end of the song. Children must stand straight and walk while balancing a book on their heads. Have them cross the room to a predetermined finish line. Provide each child with two empty Kleenex boxes. Children slide their feet inside. Hooray for snowshoes! Gather hockey sticks and pucks. Play hockey with children. You may want to play a game against children from another group within your daycare center or invite another home daycare to meet you at the playground for a friendly game. Children stand on a line and throw their snowballs in the direction you indicate. They must attempt to throw them as far as possible. Use a measuring tape to determine the winner. Variation: Make two teams. Set up two baskets. The object of the game is to throw as many snowballs as possible into their team's basket. Predetermine the duration of the game before you begin. Divide the group into small teams or invite another daycare group to participate in this activity. Each team must build a snowman...the goal is not to complete their snowmen the fastest. Have an outsider come judge the snowmen. Hide white objects in the snow within a certain area (examples: ping-pong balls, golf balls, sheets of paper, toilet paper rolls, etc.) Children search for the objects. Build a pyramid with empty Kleenex boxes. Children throw snowballs at the pyramid to make it tumble down. Place bottles on the ground leaving a certain distance between them. Children pretend to be skiers and slalom around the bottles. The bottles mustn't fall! Find a patch of ice. Children wear boots. Line them up at one end of the patch of ice. When you give the signal, they must skate (with their boots) to the finish line. Practice long jump in the snow. Children perform somersaults in the snow and end with original positions. Children are placed two by two and use a sled with a rope. One child sits in the sled and the other child places the rope around his waist. He must pull his teammate from the starting point to the finish line. Once they reach the finish line, they trade places and return to the starting point. (Open counting cards-Winter Olympics) Print and laminate. Prepare a series of wooden clothespins on which you can paint or draw numbers 1 to 9. Children count the items on each card and place the corresponding clothespin on the correct number. 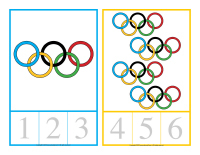 (Open Olympic Puzzles) Print, laminate, and cut out. Children reconstruct the puzzle. 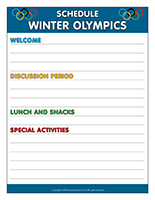 (Open association game-Winter sports) Print and laminate the game. Using "Velcro", children associate the illustrations to the correct sport. Use the picture game (Open picture game-Winter Olympics). Print and laminate. Hang the pictures on the daycare walls. Point to one picture at a time and have children mime it. Present children with a variety of magazines and sports apparel catalogues. Have them cut out the pictures which relate to the sport they love most. They can glue the pictures onto cardboard. Fire needs air. This experiment requires 3 candles and 3 glass jars (1 large, 1 small, and 1 medium). Light three candles of the same size. Cover them with the three jars. The candle in the small jar is quickly extinguished. The candle in the medium jar lasts nearly twice as long and the candle in the large jar lasts eight times longer. This experiment demonstrates that fire needs air just like humans. Warning: This experiment is meant for older children. Constant supervision is required. Fill ice cream cones with ice cream and have children roll them in red and orange candy. Prepare a store-bought cake mix and add a different edible item to either side of the cake. You may prefer to bake two separate cakes. Insert one edible item for the girls and a different one for the boys (example: jelly beans, candy, etc.). Add Olympic rings to the top of the cake. Serve the cake for dessert. Cut the cake in a manner which guarantees that one boy and one girl will find the items hidden in the cakes. The children who find them are crowned King and Queen of the Olympics. You may want to grant them a privilege for the week to make it extra special. (Open Winter Olympics scrapbook) Print the page for each child. Add it to their existing scrapbook. 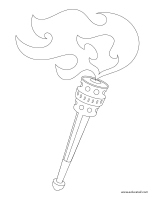 Olympic torch (for opening ceremony) Roll a white sheet of paper into a cone shape and staple. Have children cut thin strips of yellow and orange paper (to represent fire). Deposit them inside the cone or attach them with glue. Children have their very own. (Open Olympic torch) Print one per child. Children fill the flame with crumpled pieces of orange tissue paper. (Open Black and white medals) Children color their medal. Laminate. Attach a string and hang around their necks. Make an Olympic flag. (Open craft-Olympic flag) Print. Ask each child or team to draw something which represents them. Use a large piece of fabric. Children decorate it with paint and fabric markers. Add a stick and you will have your very own flag! Cut out two ski shapes for each child using heavy cardboard. Children paint and decorate their skis. Glue rope in the middle of each ski so children can slide their feet under and wear them. 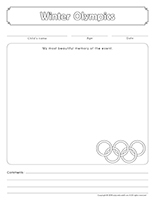 (Open coloring pages theme-Winter Olympics) Print. 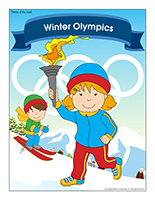 (Open creative coloring project-Winter Olympics) Print for each child. Have children complete the picture.